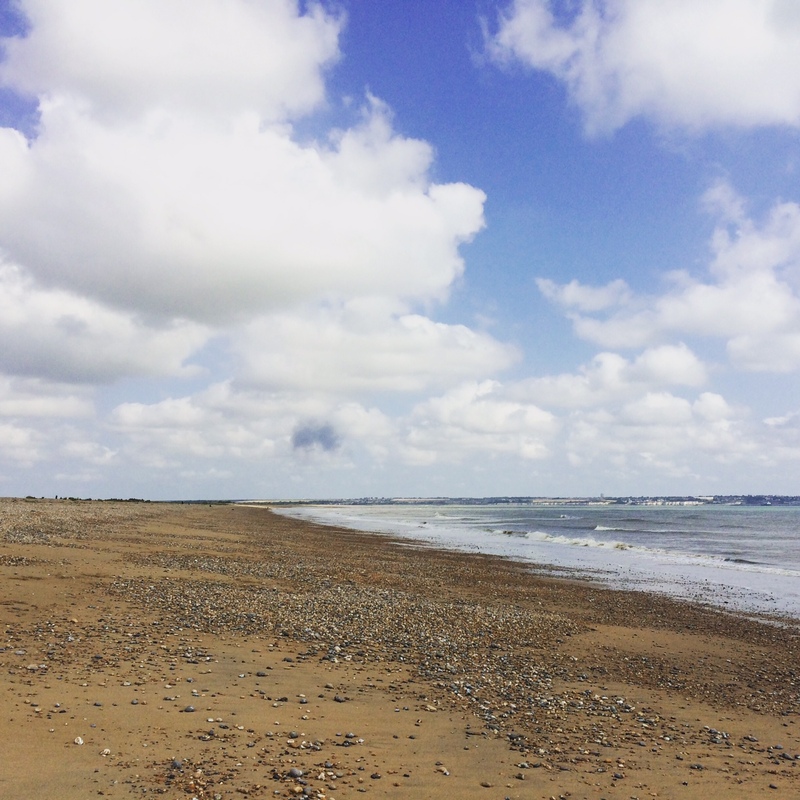 We took the dog for a walk in Sandwich Bay on Thursday after dropping our daughter off for her ‘moving-up’ day. It’s a beautiful, sweeping bay and you can see for miles. There were a couple of other dog-walkers and someone fishing but, other than that, it was just us and the sound of the sea on one side and skylarks on the golf course on the other – heavenly. 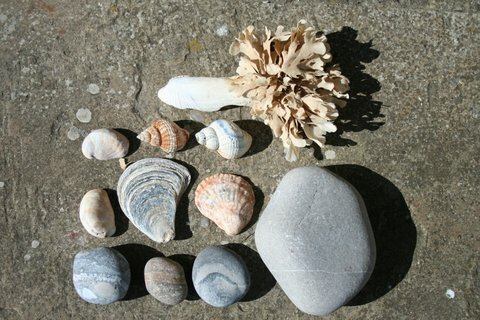 I find it nigh on impossible to walk on a beach without picking up interesting-looking pebbles or shells, bits of seaweed or driftwood, and can spend ages absorbed in beach-combing. 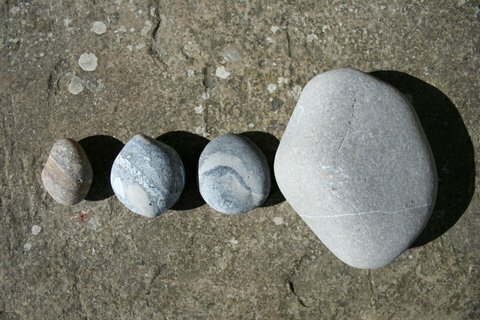 Collecting stones on the beach always reminds me of the children’s story ‘Bonting’ by Shirley Hughes. This was a story my daughter would often choose at bedtime when she was small. We loved to read it together – it conjured up such wonderful, seaside-y feelings. Shirley Hughes has written and illustrated many lovely, evocative children’s books but her stories about Alfie and his family are my favourites. ‘Bonting’ is the name Alfie gives to his special stone. He takes him on a trip to the seaside and temporarily loses him, but he turns up safely in the end. We like to pick up stones and check the feel of them to see whether they’re a Bonting or not – it has to be smooth and fit into your hand in just the right way. We have quite a few Bontings at home. I can’t quite believe that my daughter is about to leave primary school. We still occasionally read a book together (when she’s feeling a little insecure about life) but she generally prefers to curl up with a book on her own now and I’m sure it won’t be long before she wants to clear her bedroom shelves of picture books. Happily, she did have an extremely good day at her new school and was bursting with excitement when we picked her up. Lighting a bunsen burner and making it change colour was a highlight. She can’t wait to start in September. This is very good indeed as she is quite a worrier and gets anxious about new situations. I am so relieved it went well and I know that she is going to blossom there just like her brothers have. In garden news, everything is really settling into summer. I’m still finding it thrilling to wander round and check on the plants we’ve grown. I don’t even mind all the watering and dead-heading. The border by the wall is starting to look more colourful. 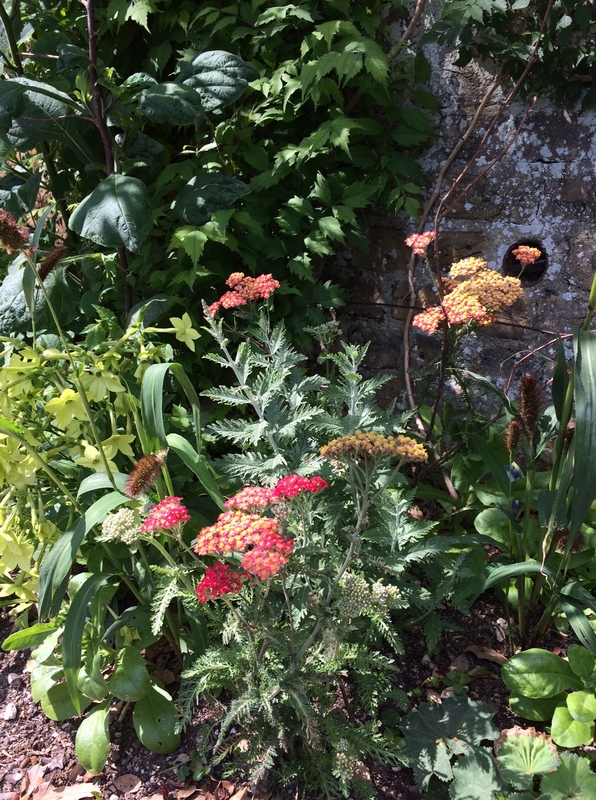 I am so chuffed with this planting and there are still so many more flowers to come. The Gaura lindheimeri ‘The Bride’ is about to start flowering, as is the Tithonia. We grew both of these from seed which makes it more pleasing. 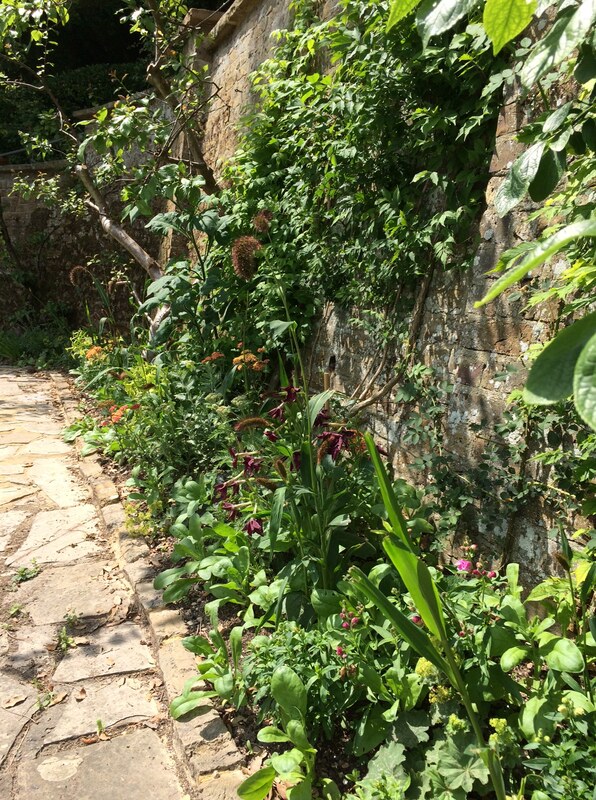 And the agapanthus we brutally chopped into quarters has even deigned to send up a few flower heads. It’s not all happiness, though. Every gooseberry bush has been stripped bare by hundreds of voracious tiny caterpillars. Gooseberry sawfly. Curses. I’m currently reading up on what to do about it. Far too late for this year but I hope to be ahead of the game next year. Any advice is very welcome! In other news… The boys are back from CCF summer camp, both sun-kissed, a bit taller and very tired from early mornings and lots of exercise (and too many late nights). It’s brilliant to have them home even though there’s now a mountain of washing and trails of stuff all through the house. And– hooray! – my genius husband found a special usb-plug on the internet to connect the old, defunct hard drive to my Mac and managed to retrieve all the important data. I have been saved from hours/days of frustration and grumpiness. He’s quite pleased about that. That sounds like an excellent week. Sorry about the gooseberries though. It’s so disheartening, I know only too well. It helps to have a pragmatic approach, as with many areas of life! Thank you Amy. The Alfie stories really are a delight. 1. I loved Alfie when my children were small – particularly ‘Alfie Gets In First’ – such insight into family life. 3. 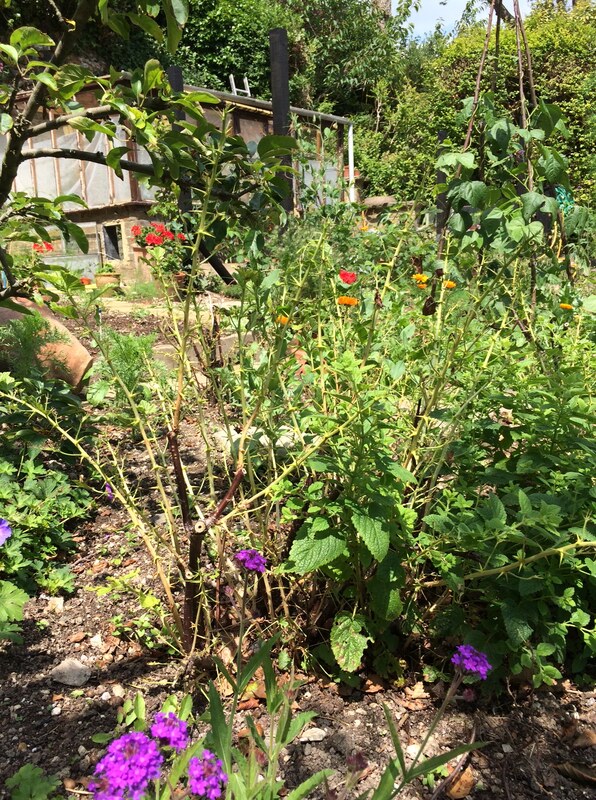 Please send some sawfly my way – my mother grows far too many gooseberries. 4. Daughters don’t stop needing you – ever. 1. I love ‘Alfie Gets In First’ too. 2. Only two flower heads so far, but that’s progress. I wonder if my Africa stone would pass your Bonting test? The one I use to sign off my blog posts. It does sit comfortably just right in the palm of my hand..
Bonting is usually very rounded and smooth, but we could make an exception 🙂 The landscape where you are looks very beautiful. We’re great fans of Shirley Hughes too, both words and pictures and I think the relationship she drew between siblings was simply perfect. Look on the bright side with your gooseberries, you won’t have to spend hours topping and tailing and you won’t need to add loads of sugar to make them palatable. I now have just one red gooseberry bush and it produces just enough for one picking and one special gooseberry fool. Ha ha, yes Sarah, there is that. I might well end up digging out the whole lot (six bushes) and planting something less troublesome. Thank you Sarah. Yes, thankfully she can now look forward to it rather than fret about it.